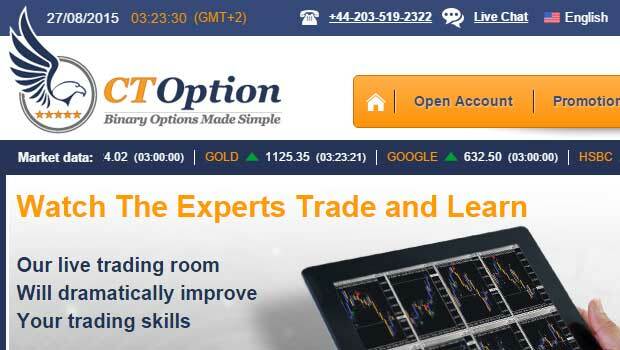 CTOption is a binary options broker that’s garnering a lot of attention recently. I’ve had quite a few emails from my readers telling me to get involved and write a review for the past few months, so I did just that. As you probably know by now if the readers ask me to do something I do it, and that’s no different this time around. Today I’ll be providing a full review and informing the readers of Binary Today about my experiences with this broker, and what traders can expect. Finding a reputable broker like CTOption can be very difficult, especially for US citizens. This brokerage is one of the few brokers that I trust that takes on US clients, to me it’s only second to Cherry Trade, and not by far. In my time with CT I’ve been pleasantly surprised by the support team. They have consistently answered all my questions and passed all my tests with flying colors. I’ve found the expiry times and asset list very good for my trading and this is why I use this broker quite actively in my trading now. I have made a habit of using multiple brokers for a few reasons. I like to have access to different assets, expiry times and platforms. Also, when I lose a couple trades with one broker I will often trade on another platform just to switch things up. I understand that this is more of a superstition than anything else but it’s important to me because the mental aspect is trading can be underwhelming at time. While most brokers are very similar, CTOption has one standout element that I feel is tremendous. The minimum trade is $5, yes just five bucks. I think that this is perfect for new traders, and I’ll likely be modifying my binary options 101 guide, so that new comers can get more bang for their buck. When I first started trading the minimum trade was $20, and at that time I really would have appreciated some smaller trades. CTOption is now one of my top five favorite brokers. They provide traders with everything necessary to be successful. If you are looking for a new brokerage then I suggest you take a closer look at CT. The feedback from the binary today community has been great thus far and it’s earned my seal of approval. If you have something you would like to add to this review, please leave your comments and questions below. I joined CT Optin with a minimum investment of 250.00. I did one trade and it was secussfull so now my balance is 378.00. I trade on News and every trade after that was “NOtrade at this time”…about 12 times in a row and I gave up and requested a withdrawel and they said they can not withdrawel with balance under 20.00. I sent email asking how my blance could possibly be 17.00 after as there were no trades after my first leaving a balance of 378.00. They never responded after many emails and I gave up. They are thieves and you should remove them from you list. They were pushed off the main list a long time ago and were put in the lower rated list. I don’t think anyone is signing up from the lower rated list. Do you still recommend CToption? I need a reliable broker with 5M and 10M expiry options. No, I don’t use this broker anymore. Are you not recommending ctoptions anymore due to not accepting US clients or you had bad experiences with them? My readers reported too many issues. So, what broker do you recommend to US traders? Are you US based? What broker do you use? And, why do you leave a positive review for CT Option up for people to read if now you think they are not good? I have an account with CTOptions and had issues. I was referred to them with WIKI Trader. The Broker Manager first assigned to me called me and pressed me with questions and I found him condescending and rude. They would not turn on the bot. The second Manager was great but it took him two weeks to turn on the WIKITrader Bot. After 1 & 1/2 weeks of having access to WIKITrader they suddenly blocked me from access to the software due to my Country. The second Manager was then no where to be found after multiple emails and so forth. I finally was able to access my original account and tried the CTOptions Binary Bot with very very poor results. Due to its use this account is drained and I am required to learn manual trading. Yes, I don’t recommend any fully automated software in binary options. I gave WikiTrader a very negative review. I want to open an account with CToption. Can you confirm that it’s still good to use. No issues with withdrawals. Hi Cyrus, I’m not having any issues with their payouts. Is it normal for assets to disappear from available options on CToptions sometimes? I have gotten some really profitable signals from BTT but the currency pair were not available at the time frame for the trade and later came up after the trade has expired. Hi Olu, I’ve never heard of disappearing assets. I do know that assets aren’t always available. Has anyone experienced difficulty withdrawing from Ctoptions ? Kindly let me know your individual experiences withdrawing from them. My experience so far is not palatable. They charged me a fee for the withdrawal. Otherwise they gave me the money I asked for (minus the fee). Hi Fexen, I’ve seen some reviews but I can only go by the Binary Today community success and my own. I have not had any issues with CTOption and neither have the readers here. I am confident in CT. Please I read some comments on a forum about CTOptions 5% rule. Have you heard of it? Can you throw more light please. Also, trust your 5mins strategy will be out by the end of the month. Hi, I don’t know what you are asking me here. Yes, I hope the 5 minute strategy will be out soon. I am looking into investing in binary options, yet I find that a majority of material in regards to it is scammy. I want to trust binary today, but I fear that this too may be a scam. I fear it because of reviews like this. Binary Options require money and claim to make large sums of money for people interested. I have read many of your post and listened to all of your podcast episodes and there is one thing I find disturbing. The brevity. The above review is for what is said to be the best broker for US traders. But the review is less than 400 words long. I’m an avid reader especially in the blogosphere. This review is shorter than my galaxy s7s review by nearly 1500 words. There is no compare and contrast, there is no talk of investment, learning curve, quality of demo account, or really any real details regarding the site besides it having 5 dollar minimum trades and time expirys. I guess my overall complaint and concern is that I want to trust you and this site, but I can’t when the review of a program that is supposed to aid me in changing the financial situation of my life is slightly longer than my review of this review. Hi Heath, I respect that and I wish I could give you more but I’m spread thin. I’m the only writer for this website, and you can imagine it comes with a lot of emails too. I know that’s probably not what you wanted to hear but honesty is all that I have to offer. I’ve been with CTOption for several months now. Like John says, as a US resident it’s one of my few options. A lot to like, but I have to say I’ve had lots of technical issues. I get booted off at random times, and reconnecting can take a looooooong time. When I’m on, the execution is pretty good, but staying on is problematic. In most respects, I’d rate them 4 (of 5), but there IT performance is a 2 at best. Hi Tom, haven’t heard this before. I’ll look into it, try emailing them, they are usually pretty good. Did you ever find out why those issues occurred? The next time it happened, I tried the live chat and asked why I couldn’t log back on after being booted off. First he directed me to the “forgot password” link. That wasn’t the problem, I had the password. Then he said reboot the router. I had multiple websites and four Mt4’s running on the desktop and the laptop, and only theirs was a problem. Finally after 40 min., it resolved itself. He claimed they had no server issues, but the problem was clearly on their end, or somewhere in the transmission between there and here. It’s happened a couple times since, I just have to ride it out. Sometimes I miss a trade I would have taken. Thanks for your update Tom. I’ll keep that in mind when I sign up with them and if that situation happens to me. I do have a question for you in concerns with withdrawal’s…have you had any problems withdrawaling from them? I am on the demo app of ct option getting my feet wet. I am a US member so it’s pretty much my only option. I was looking into binary defender as my signAL software. With that said, I did not notice a 15 minute trade option in ct option demo on the app. Do you know if there is a setting I am missing? Hi John, 15 minute trade option is certainly there, try clicking around a bit you’ll find it no problem. I agree with you John that CT Option is a good broker. Besides Cherry Trade, would you mind listing your other 3 favorite brokers ?